Used to treat obesity, ayurvedic medicines, decreasing high blood pressure. Action / Uses: For treating - Cholesterol management, Rheumatism given internally and applied locally. Astringent, Carmative, Appetite stimulator, and diuretic. 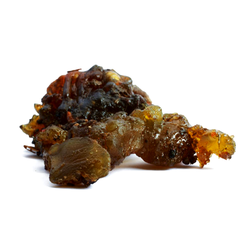 Guggul is a gum resin, produced by the stem of a small shrub(commiphora wiighti), which is native to India. Ayurvedic practitioners have used guggul for various benefits.